Hello, darlings! I had a wonderful time in Calgary. Thank you so much to the organizers of WordFest for inviting me and for running such a well-organized show! I’ve been on the other side of convention organization before, and I know how many unexpected challenges come up. I thought y’all did a particularly nice job with this. I met many interesting writers and artists at WordFest, but I want to give a special shout-out to Shane Peacock, who did a program with me at the Calgary Public Library. He writes the Boy Sherlock Holmes series, which I am definitely going to get for my son. I think they sound right up his alley. Shane also gives a really engaging presentation for kids, if you ever get a chance to hear him. Super fun. I spoke at two schools, Ecole Lawrence Grassi Middle School and Alice Jamieson Girls’ Academy, and I could not have asked for two nicer groups of kids. Y’all were good listeners and you asked great questions. Thanks so much for having me! This coming week we have two bits of excitement. 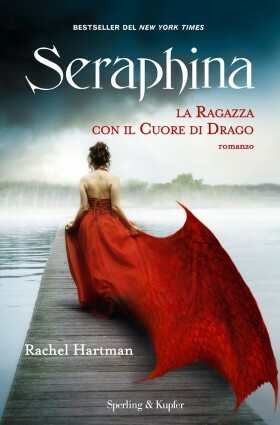 First: Tuesday is the book birthday of the Italian edition of Seraphina: la Ragazza con il Cuore di Drago. Happy birthday, book! Secondly: I will be appearing in two events as part of Vancouver Writers Fest this week, Words Run Amok with Susan Juby (moderated by fellow GG finalist Susin Nielsen) on Tuesday, and Flights of Fantasy with Kenneth Oppel on Thursday. Come see us, if you have a chance!